Smart Kalapoi Fleet Lined Up Until The New Year. ____ Out of the Waipara Valley and onto the Canterbury Plain; a flat road all the way to Christchurch. A big town, well laid out, with Cathedral Square in the centre; being set up for New Years celebrations. A powerful earthquake hit the area on Boxing day but I cannot see any signs of damage; although the cathedral tower is fenced off. Maybe to protect revellers from falling masonry or maybe to protect the cathedral from falling revellers. I spend an afternoon looking around town then ride out to a campsite on the south side. Camped next to an apricot tree with a pub next door. ____ From Christchurch across the plain to Ashburton on a fine sunny day with just a slight headwind. Across the longest bridge in New Zealand at Rakaia; over a mile long and a narrow two-lane. A lot of NZ bridges are narrow with no provision for cyclists; this calls for special tactics to avoid getting squeezed into the wall. I drive in the middle of my lane; anything wanting to come past must wait for a gap in oncoming traffic and use the other lane. I’m sure it annoys some people but as most of the time I ride on the hard shoulder they have little reason to complain. ____ People are always very friendly; always with a lot of questions. Apart from “Where to?”- “How far?”- “Where from?”; a common question is “ Why New Zealand?” to which I have found the best answer is: “Because I hate Australians.” This is not true but always goes down well. The other popular question is: “How’s your bum?” to which I casually answer, ”Ok.” In fact I know exactly how my bum is; thanks to a digital camera with flash and a laptop on to which I can download and enlarge daily images; I have a good database of how my bum is standing up to the rigours of cycle-touring down-under. If there is any demand from the medical profession reading this; I can easily post pictures for your perusal. Te Papa - National Museum Of New Zealand. ____Away from Picton ,bright and early, south to Blenheim and it’s vineyards for breakfast. Then some hard climbs and the Dashwood Pass before reaching the Pacific Coast at Wharanui. With a north wind behind me, I make good headway; stopping at the Store, Kekerengu, for tea. It’s late when I reach Kaikoura, a popular whale-watching town that is bursting to seams. I get squeezed into a corner with my little tent after my first day of more than 100 kms cycling. ____ Gale force winds rip through the campsite during the night; as I am thankful for my sheltered corner. Several tents are torn to shreds by the north-westerly. More coastline riding around Goose Bay, where plenty of seals mess about in the kelp or lounge about on the rocks only yards from the busy road. After the road turns inland there are some serious long climbs, but when the road flattens; the wind changes to a gale from the south making riding nearly impossible. I put into the Staging Post campsite at Hawkswood after less than 50 kms for the day. As storm clouds are looming, the offer of a rustic cabin seems a good idea. I get my money’s worth by lighting the wood burning stove and burning all the logs, all night, in an effort to dry some laundry. ____ Dawn breaks to a cloudless, windless sky; what a difference a day makes. The terrain is not flat but much less demanding. After stops for tea at Cheviot and Greta Valley, it’s a satisfying days ride down to Waipara and the Waipara Sleepers campsite, a railway themed set-up. Sleepers of the large wooden railroad tie sort of thing. Coffee houses seem to be very much in vogue here in NZ; but a pot of tea suits me and is good value with a jug of hot water arriving with the pot and the milk. There’s something you don’t see to often these days any where else. Christmas in Wellington, New Zealand. ﻿ ____ Christmas Eve, a day at Te Papa, the National Museum of New Zealand. Down by the waterfront, a short walk from the hotel, so the bike has a rest day. Very interesting displays on the Natural History of the country before Europeans arrived. Also a lot of stuff on Maori culture, with impressive ocean-going canoes up to 70 foot long. In the evening I rendezvous with my cousin Paul; who I had met in England during his big European tour with his wife Judith. That was in 1988. My Uncle Len too is there, he left England when I was 4, I cannot remember him but we had a good long chat about the old country. We went to the same school and although he left 20 years before I started; we had the same history teacher, Mr. Stanley Kaye, amazing. _____On Christmas Day I am invited to eat at Esther and Scott’s, a cousin I had never met and her husband. Also James, another cousin and his family are there. An excellent Christmas dinner on a hot sunny day with plenty of cold beer in a hilly suburb of Wellington. _____ Up early on Boxing Day, down to the quay and on board the Interislander ferry to the South Island. 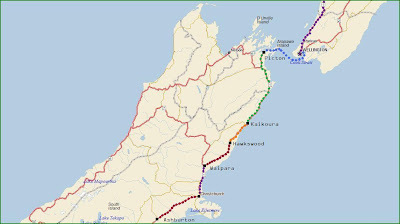 A three and a half hour crossing of 90 kilometres; a long haul out of Wellington harbour, a long stretch in the Tory Channel leading into Picton harbour. Only just over an hour on the open sea; crossing the Cook Strait, nice; my kind of ferry crossing. Picton is sunny, breezy and a South Pacific Island band is playing in the park. I decide to camp in Picton and start the journey south tomorrow. ____Two more days of overcast weather; the rain holding off until the late afternoon. Sending me to the nearest campsite for a cabin. Three long climbs on the first day; finishing with Vinegar Hill and the first puncture of the trip at Hunterville. 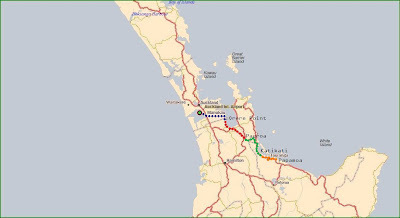 The second day; from Marton, through Bulls, Foxton and on to Waitarere. Now on the west coast plain and the winds sweeping in from the Tasman Sea. ____It has been one long battle to get fit; as I approach this part of the tour as I approach love-making. Ride for as long, as hard and as fast as possible; then collapse into a deep sleep. Wake up and start riding again. The only difference being: I don’t have to justify my performance to the bike. ____Day Ten is the first day for over a week without rain and I’m back under canvas again at Paekakarike after following the Kapiti Coast Cycle Trail; named after the island which shelters the beaches from Waikanae to Whareroa. ____Then 50 kilometres to Wellington, not the easiest of cities to enter by bike. Restricted roads and hilly terrain; but another dry day if a bit breezy. A hotel for the night and a walk round the city centre; busy with Christmas shoppers on the day before Christmas Eve. Days 4-5-6-7 in the Rain. ____I’d be a liar if I said the last four days had been enjoyable. It’s been rain, rain and more rain. The tent has stayed packed away and I’ve taken to renting cabins; little huts with just a bed, table and chairs. These have varied in price and standard but are situated on most campsites, motor camps and trailer parks. A lot of places have “residents”; people who live all year in their caravan. These have been an endless source of advice and laughs. At Okere Falls; three guys, on the insistence of a lady, were demolishing a two foot diameter tree stump with a cordless electric drill with a one inch bit. My hut was next door and during conversation whilst the battery was recharging; we all agreed that cycling the length of New Zealand was very similar to what they were attempting. ____Day Four started at Papamoa Beach and soon I was in Te Puke [Tay-Pew-Kay], the Kiwi Fruit Capital of the World. Everything is Kiwi Fruit. Around April there is plenty of casual work picking the little furry buggers; also pruning at other times. Google: Seeka Kiwi Fruit if you want to give it a try. ____Day Five had me back in the volcanic area of Rotorua and down to Taupo on Highway 5. The side road through Reporoa was a pleasant level ride and I found that most service stations sell hot pies and drinks. A pot of tea and a hot sausage roll goes down a treat on a wet and windy day. The thermal baths at the campsites are another good thing; a soak in the volcanic heated water of 34 degrees C helps my body recover at the end of the day. ____Day Six and my regular breakfast is now at McDonalds; of which New Zealand has plenty. But they are split into the normal McD and McCafe; an arty pastry and cappuccino section. What’s all that about? A bit like going to a whorehouse and the Madam saying that they also have books. I go there for sausage ‘n’ egg muffin, greasy hash brown and normal coffee; same as everybody else. An easier day than the last few; just down the east side of Lake Taupo to Turangi. Any further would have left me short on places to stay. But I did have the good fortune to be in the Hungry Trout Café, eating one of their excellent sausage rolls, when a violent thunderstorm passed over head. ____Day Seven, the hardest day so far. 56 kilometres without a town or village, non-stop rain and all on the busy Highway 1. The Desert Road; but more like moor land than arid desert, climbing to 1074 metres beside the mist shrouded active volcano called Mount Ruapehu. A flat plateau area that leads through the army training area of Waiouro, then back into the ups and downs of sheep pastures. Ending the day at Taihape, which rhymes with Die Happy. ____ From Paeroa , it was eight kilometres down to the first bit of off-road riding: the old rail-road route through the Karangahake Gorge. It just started to rain as I entered a 1000 metre tunnel; but it didn’t keep me dry as water dripped down from the roof. Rain continued off and on all day. The track took me to Waihi and the Martha gold mine; a huge open pit right in the middle of the town. From then it was Highway 2 and spray from the trucks and cars until Katikati; home of the Sapphire Hot Mineral Springs and campground. Even though it was raining, it was good to relax in the hot pools but the place was really shabby and didn’t look like it had any money spent on it for thirty years. ﻿ ____ A bright sunny start; which dried the tent, always a good thing when camping. 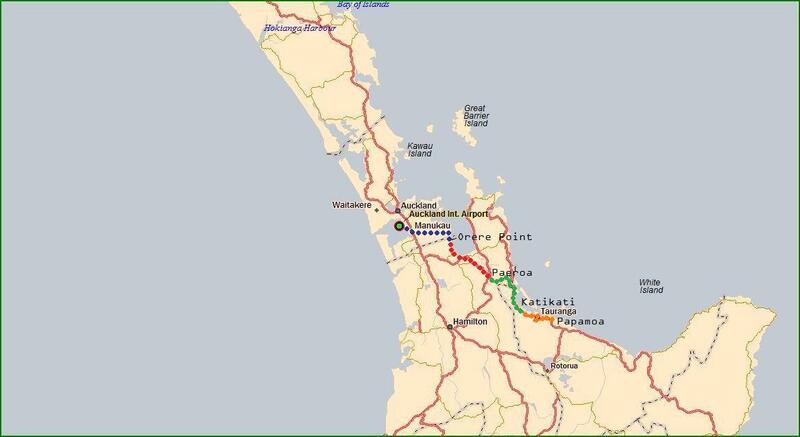 Then more of the busy Highway 2; across the undulating land of the Bay of Plenty. Bay of Plenty of Kiwi-fruit orchards to the twin towns of Tauranga and Mount Maunganui. A container port and beach; it reminded me of Felixstowe and Harwich, except Felixstowe doesn’t have a bloody great volcano sitting at the harbour entrance. South on the ocean-side road to Papamoa Beach, an early finish so that I can do some laundry. Cheap camping at only $10 a night for a tent, but the place had a distinct trailer park feel. The First Two Days On The Bike. ﻿ ﻿ ﻿﻿ ____The NZAA came and ripped the door panel off and jammed up the glass with a piece of wood. The camper van people didn't seem very happy but it serves them right for hiring out rubbish. Because biking out of a big urban area can be a pain; I drove round in the Toyota and planned a route going out eastwards to the sea. Undulating to Manukau, Manurewa, Clevedon and first sight of salt water at Kawakawa Bay. ____Then there was a sting in the tail of the days ride. A 350 metre climb over the Mataikokako Headland to the campsite at Orere Point; the hardest 3 kilometres of the day. An Australian couple, also on there first day joined me on a park bench halfway up; they were finding it tough even with electric motors fitted to their bikes. We finished the day side by side at the same camping. ﻿ ____The second day turned out to be much easier. Thanks to the Seabird Coast, a flat marshy area and the Hauraki Plain, flat lowlands given over to dairy farming, it was good going, even the wind was behind me. But I still need long rests between stints of an hour in the saddle; every park bench and picnic table gets a half hour visit. It's better to recover sitting down looking at a map than falling off with exhaustion; things will get easier but I'm in no hurry during these first few days. ____The night's stop is at Paeroa, I'm glad I'm writing these NZ place names; it's easier than pronouncing them. Famous for the L & P lemonade drink, a favourite in these parts. A busy town on Highway 2, it looks good for a breakfast in the morning; with proper bacon and not that disintegrating North American stuff. Another 70 kilometres to match the day before. All Systems Go For The Big Tour. ____I’ve bought a bike, a tent, a sleeping bag plus some bits and pieces. The cycle touring starts tomorrow. The camper goes back and good riddance; the passenger side window now refuses to come back up and I now have no security. How a company can rip out the seats of a people carrier, stick in some second rate carpentry and some ill-fitting curtains; then rent it out with 197,000 kms on the clock; I don’t know. ____Auckland seems a good, clean, safe city. The two nights I’ve had at the campsite at Remeura have been cheap at $17 a night and I’ve been able to ride around it on the bike. Very hilly landscape and sunny with a cool breeze from the sea; it’s good the bike hasn’t been loaded with luggage. ____Free internet seems non-existent in New Zealand and very slow as well. Uploading pictures takes for ever; but I’ll try and get some put up when I have a good signal. There seems to be very little free stuff; all the big natural sites are fenced off and charge admission, but I have been in tourist hotspots. The journey to find the true New Zealand starts tomorrow. The plane from Vancouver, BC. ﻿ ____A Sunday midday flight out of Winnipeg to Vancouver, a four hour lay-over; then 14 hours on the plane. Landing at Auckland, New Zealand, just after dawn on Tuesday. By crossing the International Date Line at midnight, I completely lost Monday, 5th December 2010; good job it wasn’t my birthday. ____This is going to be a bicycle touring holiday but I’m starting out by hiring a cheap campervan so that I can get things together. It’s a 15 year old Toyota Granvia, a second-hand import from Japan, a heap of junk with dodgy electrics. First night is at Rotarua, a tourist town with volcanoes, geysers and hot water mineral pools; just right to ease an aching body. ____ Second night is at nearby Taupo, the Great Lake, overcast early; but then up to a sunny afternoon of 25 degrees C.
2010: Summary of the Year. ____ Eleven months work and despatched for over 126,000 miles, means an average of over 10,000 per month for the calender year and that is all BFS ask: so the rest of the year is a holiday. 204535 kilometres added to C596 since January and I'm sadly resigned to loosing the Kenworth while I'm away. Over three years together and the truck has never let me down. In 2010, we had no breakdowns, blowouts or bumps; lost a few days to the weather but kept rolling through out the year. An average trip length of 6015 kilometres; I didn't do a trip to the Maritimes, Texas or California but otherwise had a varied workload. ____ Low point was getting a fine for an axle overload but $510 works out at $2.50 a week for the four and a half years I've been in Canada; not too bad. Let's hope the next fine is 4 1/2 years away. Highlight of the year was the trip to Cathederal Grove on Vancouver Island; the massive Douglas firs and the young lady in her graduation gown hugging the Big Tree. ____ I'm off to New Zealand for three months of cycle touring and to get fit. It's a long-held ambition of mine with cycle touring being my adventure holiday of choice since 1998. Top of the sleeper is about 10 foot high : The trees are..................very tall! ____DAY 1: A long time ago, I stopped trying to work out the economic viability of loads given to me to transport. This trip starts with a 800 mile empty run down to Quincy in Illinois; a day and a half drive to pick up some pallet racking for Suncor in Fort McMurray, Alberta. There is six inches of snow on the trailer as I head out on Sunday morning; I wish it was 40,000 lbs of lumber, the roads are ice and hard-packed snow. I could do with some weight, to help give some traction. Snow flurries continue all day as I make it as far as Sauk Centre, Mn. for the night. ____DAY 2: Snowing continues as I take the Minneapolis By-pass south towards Albert Lea. Then a satellite message arrives: I am required to take two photographs of the load when I have tarped it, at the shipper's premises, to prove to the customer that the load will be tarped for all it's journey. Well; there is nothing that makes me rear-up quicker than when someone insinuates that I do not do my job properly.If they don't trust me to tarp this load as soon as it is loaded then they can get another driver to do the job. Parked at Albert Lea, waiting for my next assignment; there is a flurry of satellite messages until the office agree I don't have to take pictures. The fact that I take lots of photos of all my loads is beside the point. I continue south, down to the Flying'J at Wayland, Missouri, about half an hour from Quincy on the other side of the Mississippi River. ____DAY 3: I'm loaded by 10 o'clock, when Rob Jackson turns up for a similar load of steel frames, he too has run down empty and with the same delivery date, for the following Monday, we decide that with so much time on our hands; we can go home for 2 days. The first snow free day for ten days and a high of + 4C; good progress up to Hasty, Mn. after checking the weights at Wayland. ____DAY 4: The snow returns soon after I start out and from Fargo, ND. all along Interstate 29 to the Canadian border it gets heavier. The roads across Manitoba, from Emerson to Steinbach, are an unploughed six inch carpet of loose snow. The wind is strong and conditions are close to "white-out." If I wasn't so close to home I would park-up, but press on reaching the yard just before dark. ____DAY 5: It is Thanksgiving Day in the US and probably the reason this job is shaping up the way it is. It's a big holiday in the states and everything except retail outlets will be closed until the following Monday; meaning that my load had to be up and running earlier than usual. But I'll take the two days at home; as there is more snow and temperatures down to -17C. ____DAY 6: Another reason for the different work pattern could be the fact that BFS now has 25 more trucks on the road than it did two months ago. The result of a new recruiting office in Winnipeg and an attractive looking pay package for new drivers. These new drivers will be expecting good miles and BFS's promises to be delivered; so the spread of the work is likely to be different than it was when there was plenty of spare trucks in the yard. How many new guys will still be on the payroll at the end of the winter is anybodies guess; tarping steel beams in -40 conditions tends to sort the men from the boys. ____DAY 7: Saturday and the day of the BFS Christmas Party; the Steinbach yard is crammed with all the trucks of the out-based drivers, in town for the free food and drink. I won't be going, again. I can't bring myself to socially interact with office workers who keep me behind locked doors and talk to me through sliding glass windows. People whose silly mistakes of the past year have cost me so much time and money. I would rather spend the evening face down in a ditch of muddy water; where I ended up, the last time I attended such a function many years ago. The trailer brakes are frozen on; but after hammering them with the snipe bar, I have a trouble free run up to Saskatoon. It's now down to -23 and the engine runs all night to keep me warm. ﻿ ____DAY 8: Into Alberta and the cross-country run to the bottom of Highway 63 at Grasswood. Then the long haul to Fort McMurray on the very busy 2 lane. They are making it 4 lane but I'm surprised to see earth-moving equipment working under floodlights, on a Sunday evening in November, a hundred miles from anywhere. With limited parking options in Fort Makemoney, I elect to stop at the abnormal load staging area, 10 miles south of town. Again there have been snow flurries and it is bitterly cold; again the Cat purrs. ﻿ ____DAY 9: A good, if over priced, breakfast to start the day; where I meet up with Rob Jackson. We head off together northwards to Tar Island and the Suncor Oilsands refining plant. Still dark, an endless stream of buses and pick-up trucks, plus tippers, tankers and a couple of green Kenworths line up for entry to Suncor. Oil platforms at sea may only have a dozen workers to produce their product but in the tar sand pits of Canada, oil production is very labour intensive. Due to the weekend snow fall; there is a wait before we can be unloaded. A lay-down area has to be cleared and our pallet racking has low priority on the snow clearers list. It's gone three o'clock by the time I'm pullin out, but the reload is lumber from the Northland Forest Products sawmill, 7 kilometres back towards town. A load to Oak Bluff, near Winnipeg. The lady at the lumber mill says I am the first truck to come in for a load that day; it seems the construction industry has already gone into hibernation. By the time I have refueled and set off south, it is dark. Then freezing fog forms, not a good finish to the day. Back down to Grasswood and the baby Flying'J. ____DAY 10: A heavy load of lumber; more snow in the air, falling and blowing. Alberta into Saskatchewan and I chose the 4 lane option down to Regina, as opposed to the more direct two-lane across to Yorkton. The radio speaks of -25 in northern Sask against a balmy -10 in the south, such is the effect of the Jetstream on the Prairie climate. Regina's Husky Truckstop, free wi-fi and the internet is buzzing with stories of a firing at BFS. The Trucknet Forum has never known such a thread! ____DAY 11: Snow to start but then a bright clear day. Oak Bluff is a regular delivery and one of the quickest. Thirteen packs of lumber, two at a time, and I'm in and out in 30 minutes. Parked up , trailer dropped, oil heater plugged into the electric, truck booked in for its 800,000 kilometre service and thats me finished for this year. Holidays are here!